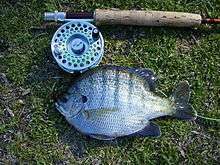 A panfish, also spelled pan-fish or pan fish, is an edible game fish that usually doesn't outgrow the size of a frying pan. 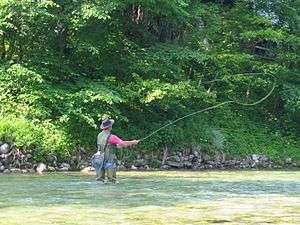 The term is also commonly used by anglers to refer to any small catch that will fit in a pan, but is large enough to be legal. However its definition and usage varies with geographical region. According to the Oxford English Dictionary, the term was first recorded in 1796 in American Cookery, the first known cookbook written by an American. A typical panfish, a bluegill from an Alabama farm pond. The term panfish or pan-fish has been used to refer to a wide range of edible freshwater and saltwater fish species that are small enough to cook in a small pan. In American Food and Game Fishes. A Popular Account of All The Species Found In America North Of The Equator, With Keys For Ready Identification, Life Histories And Methods of Capture – Jordan and Evermann (1908) they identify all the following as panfish in some form or another: Yellow Perch, Candlefish, Balaos, Sand Launces, Rock Bass, Bullheads, Minnows, Rocky Mountain Whitefish, Sand Rollers, Crappie, Yellow Bass, White Bass, Croaker and of course most of the common small sunfishes such as bluegill and redear sunfish. As a pan-fish we do not know of any better among American freshwater fishes. We have experimented with the yellow perch and several other species, including both species of black bass, the bluegill, wall-eyed pike, and rock-bass, eating each for several days in succession, and found the yellow perch the sweetest and most delicious of them all. One does not tire of it so soon as of the other kinds. Several other persons who tried the same experiment reached the same conclusion. In most parts of its range it is highly esteemed, and in many places it is of very considerable commercial importance. In the Great Lakes, the Potomac River, and the small lakes in the upper Mississippi Valley large quantities are taken, which always find a ready sale. 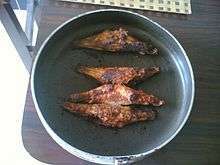 TO FRY FISH - Most of the smaller fish (generally termed pan-fish) are usually fried. Clean well, cut off the head, and, if quite large, cut out the backbone, and slice the body crosswise into five or six pieces; season with salt and pepper. Dip in Indian meal or wheat flour, or in beaten egg, and roll in bread or fine cracker crumbs trout and perch should not be dipped in meal; put into a thick bottomed iron frying pan, the flesh side down, with hot lard or drippings; fry slowly, turning when lightly browned. PAN-FISH. Place them in a thick bottomed frying pan with heads all one way. Fill the spaces with smaller fish. When they are fried quite brown and ready to turn, put a dinner plate over them, drain off the fat; then invert the pan, and they will be left unbroken on the plate. Put the lard back into the pan, and when hot slip back the fish. When the other side is brown, drain, turn on a plate as before, and slip them on a warm platter, to be sent to the table. Leaving the heads on and the fish a crispy-brown, in perfect shape, improves the appearance if not the flavor. Garnish with slices of lemon. ↑ New Mexico Game and Fish. "Warm Water Species: Panfish" http://www.wildlife.state.nm.us/recreation/fishing/warm_water_species/Panfish.htm (accessed June 3, 2007). ↑ panfish, n. Oxford English Dictionary Third edition, March 2005; online version September 2011. Accessed 29 October 2011. An entry for this word was first included in New English Dictionary, 1904. ↑ Jordan, David Starr, PhD; Evermann, Barton Warren PhD (1908). ’American Food And Game Fishes. A Popular Account Of All The Species Found In America North Of The Equator, With Keys For Ready Identification, Life Histories And Methods Of Capture. New York: Doubleday, Page and Company. pp. 120, 227, 242, 247, 263, 329, 335, 366, 338, 376, 377, 463. ↑ Jordan, David Starr, PhD; Evermann, Barton Warren PhD (1908). ’American Food And Game Fishes. A Popular Account Of All The Species Found In America North Of The Equator, With Keys For Ready Identification, Life Histories And Methods Of Capture. New York: Doubleday, Page and Company. p. 366. ↑ Ziemann, Hugo; Gillette, F. L. (1901). The White House Cookbook-A Comprehensive Cyclopedia of Information for the Home. Akron, Ohio: The Saalfield Publishing Company. pp. 49–50. Perich, Shawn (2006). Catching Panfish: Tactics for Sunfish, Crappies, Yellow Perch and White Bass. Chanhassen, MN: Creative Publishing International, Incorporated. ISBN 1-58923-259-3. Gruenwald, Tom (1997). Panfish-Hooked on Ice Fishing II. Secrets to Catching Winter Fish, for Beginners to Experts. Iola, WI: Krause Publications. ISBN 0-87341-489-6. Dalrymple, Byron (1947). Panfish-The Art and Enjoyment of Light Tackle Fishing for the Common Fishes of the United States. New York: McGraw Hill. .